Andrea felt it was vital that the Unicorn was part of the international celebrations for Women and Girls in STEM. The Unicorn has a long history of training boys and men, but it also has a forgotten past of training women and Andrea wanted to promote this in-conjunction with the vital and vibrant role women have in STEM. 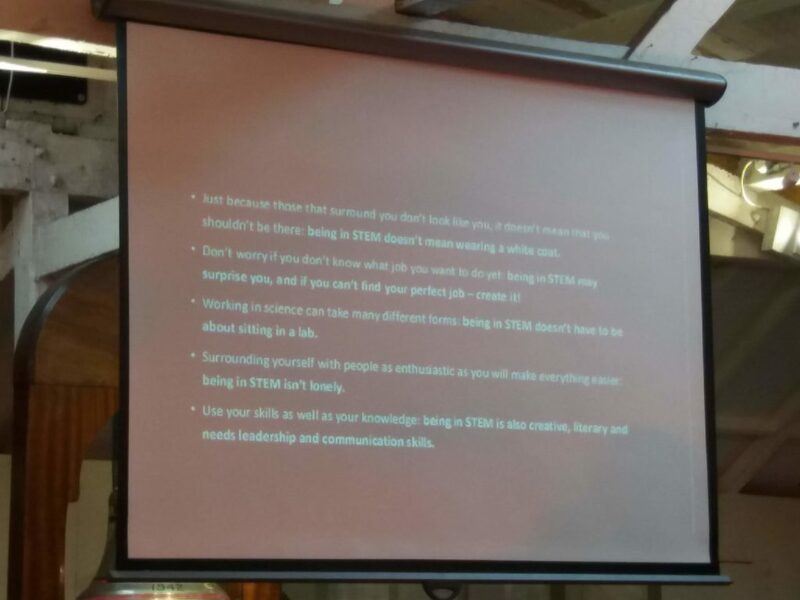 Andrea was organising the We Matter Networking Event, which brought five incredible women with careers in STEM fields onto the Unicorn on Saturday 9th February to share their story and advice they had for girls looking to go into a STEM career themselves. We highly recommend you watch the Facebook Live video (available on HMS Unicorns Facebook page) of Catherine Gemmell’s talk, as she shares brilliant advice about participation and resilience to discover and achieve your career dreams. This event was open to the public, but Andrea wanted more involvement from local girls, as they were the target audience, who Andrea was hoping to inspire. Rachel and Andrea worked together to devise a plan of STEM Ambassadors; local school pupils with an interest in STEM who would help promote and support the event (gaining work experience) while getting an opportunity to engage with the speakers. Eleven S3 girls from across Dundee and Angus attended a training session on-board the Unicorn on 29th January. Sarah from the Dundee and Angus Chamber of Commerce helped Andrea and Rachel to deliver workshops on presentation technique, the value of social media and photography. Presentation and communication skills are invaluable soft skills that are required in any career. The ability to successfully use social media as a marketing tool is something many employers are now looking for. With new knowledge and confidence, the girls began to plan how they could help Andrea promote the event and support the speakers at the event. On the day the STEM Ambassadors arrived bright and early to help Andrea set-up and welcome the speakers. They then got to be inspired by Catherine Gemmell, Scotland’s Conservation Officer from Marine Conservation Society, Michelle Rennie the Director of Major Transport Infrastructure Projects at Transport Scotland, Junior Doctor and Medical Researcher for NASA and ESA Christina Mackaill, Catriona Patterson the Green Arts Project Manager at Creative Carbon Scotland and incredible young STEM talent and spokesperson Mhairi McCann. By participating in this event the STEM Ambassadors not only got to hear about incredible woman in interesting roles, inspiring them towards success themselves, they also got hands-on experience of events planning, marketing and networking that they can discuss in future interviews. The girls also got an opportunity to grow their knowledge and abilities with valuable soft skills which support their future ambitions. 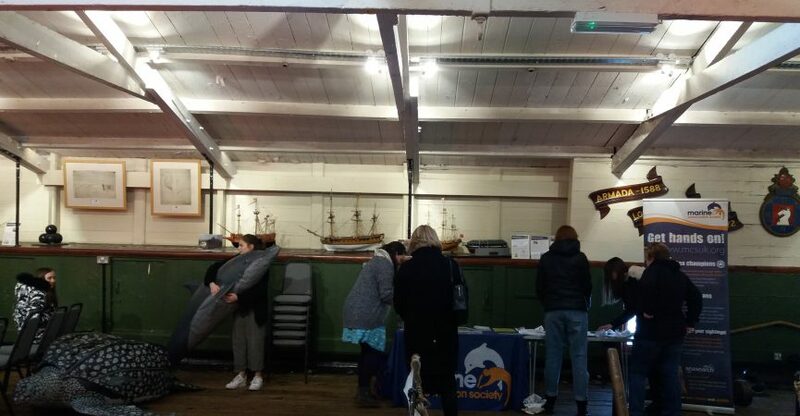 The whole experience broadened their horizons, gave them insight into the working world and introduced them to carers they may not have considered before. Andrea also got good outcomes from her in-put. She received help with her event, but most importantly she knows that We Matter connected with her target audience and had an impact. There are always lots of ways to include and support local young people through your company and its’s day-to-day activities. If you would like more information or support with this, don’t hesitate to get in touch with the DYW team.